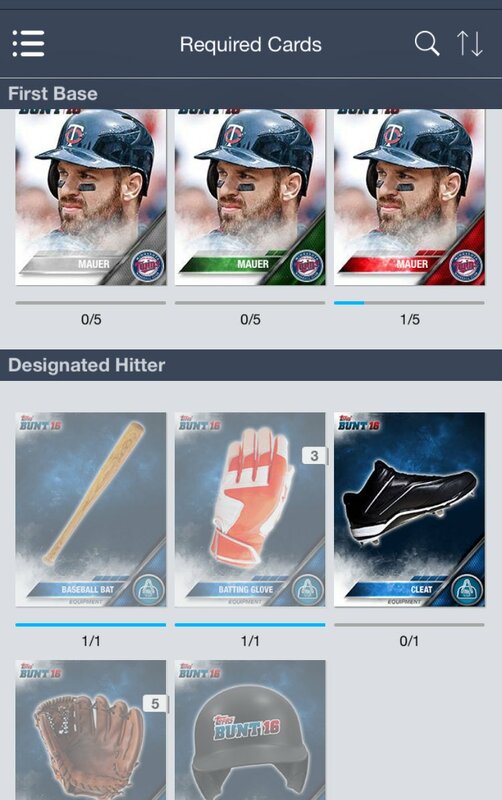 Last week, ToppsMike took some time to answer some open ended questions on the update for the 2016 season. Now that the update as launched, I wanted to go a bit deeper into the features with him. The app itself hasnt changed ALL that much aesthetically, but lots of different new elements will make this a very fun 2016 campaign. Before we get started, I definitely want to talk about how excited I am for the new season. After talking with Mike it is ABSOLUTELY clear that they took a lot of the opportunities for growth last year and tried to find ways to make them better. Similarly, the user experience is a big focus for the Bunt team. I counted 5 or 6 times during the conversation when Mike mentioned it being a factor for decision on a feature or release. With how much I have talked with the app producers for all of the apps over the last few months, this was something I took notice of. Even though he might be vilified in the article comments over some mistakes and things out of their control, I will assure you they are their own biggest critics. That is what drove a lot of the feature updates from 2015 to 2016, and I think everyone will be excited to see how they use them to keep the app fresh for the long baseball season. Hopefully after reading the last interview and reading some of the points here, you will be as excited as I am. Now that the app is live, everything is fresh and everything looks great. I am beyond pumped to see what they have in store. From 2014 to 2015, the app’s design and aesthetic changed a lot. The way things functioned in 2014 was vastly different year over year for 2015, and it led to some of the users dealing with errors or even just not understanding what was going on. This year, the app’s look and feel only changed slightly to incorporate the new branding, but the overall design is relatively similar. Right now its more of a true update instead of a complete overhaul like last year. The store looks similar to the recent changes from the last update a few weeks ago, and the card sheet is the same as well. Although there wont be a showcase to start off the year, I have now gotten confirmation from Neil and Mike that they are working on SOMETHING regarding that type of capability as the year goes on. Adding the progress bar for levels on the home screen below your name is a great way to stay on top of your XP. The card exchange button was added to the top as well, but that actually doesnt look like the best way to get to the cards you need to shred. Its best to go from the all cards sheet, just like Star Wars. Lastly, Carlos Correa is the spokesperson for the app this year, and that should come as no surprise. He is a great ambassador for baseball, and a true up and coming superstar. He should end up with a lot of content this year, which should make Astros fans pretty happy. Right now, there are a few packs in the store, all of which give some sort of mix of base, coupled with the new equipment cards Ill get to in a second. There is also a 15k base value pack you can get to by clicking on the pack button when you bring up a single card from your sheet. Additionally, there is a 10 pack blaster available for 125k, which includes 1 teal boost as a reward, along with 10 equipment cards. I opened a few of them and got a lot of orange cards, and some good teals to use. The equipment cards have their own pack as well, and you can get some of the better ones through the pack button as well. There is a 50k value pack that can pack a real punch, but you might want to hold off until you have the goods to shred for the top boosts. Previously, Mike mentioned that there were going to be similarities between contests during last year’s postseason and this year’s setup. There will be a focus on making it easier to play certain card based on league affiliation, as well as some introduction of more contests for people to play fantasy style. Bottom line, he said, they wanted to make sure there were more winners every day, and make it worthwhile to participate as much as you can. He also made sure to explain that the scoring issues from last year have been worked out as much as they can be, and that he doesnt foresee anything more than the occasional blip from the provider as the season goes on. Last year, as they mentioned in the app, the issues with scoring came from the provider’s decision to change the output format on short notice. He assured me that they adjusted everything to be positive it wont have the same issues as last year. Seeding the contests by XP Level was also discussed in the interview and we went a bit more in depth this time around. Obviously someone like last year’s PS Champ, Card_Guru16, will be able to slaughter everyone likely from day one for a lot of reasons. Putting those type of players in a different contest bracket will make sure that the smaller fish have a shot at winning too. There may be all inclusive contests as the season rolls on, but to start, the levels will be a great way to seed people against those they can actually have a shot at beating. The prizes will also be changing, especially as the base levels change for 2016. There will be special cards offered through the contests like last year, but there will also be valuable packs of cards in what are being called “blaster” boxes. These boxes could mean winning a contest will net you many, many cards. This is where things are really going to get fun, as scoring is getting a bit of an adjustment this year, from what Mike’s description sounded like. In previous years, it was much more lucrative to roll with top pitchers, even though they may have a bad inning or give up a few runs. When they were considering adjustments for 2016, they wanted to make the pitcher’s scoring more authentic to a situational style. The way he said they did this, was increasing the points for positive action on the hitters side, and increasing the impact of negative actions for the pitchers. So, if Kershaw pitches 7 lights out innings, but gets 2 guys on base in the 8th – you are going to want to sit him in favor of the hitters in that situation. If Trout lines a 2 RBI double to the gap, the points will be more reflective of the impact that hit had on the game. If Trout flies out to the RF, the negative impact wont be as high as it was on him last year. This isnt saying that pitchers will be worthless against the hitters, but that its much more lucrative to play in the situation itself than it ever has been. As a whole, Levels are going to change the face of Bunt. After hearing Mike’s extensive rundown on the planning that went into the different aspects of the feature, this is what excites me the most. 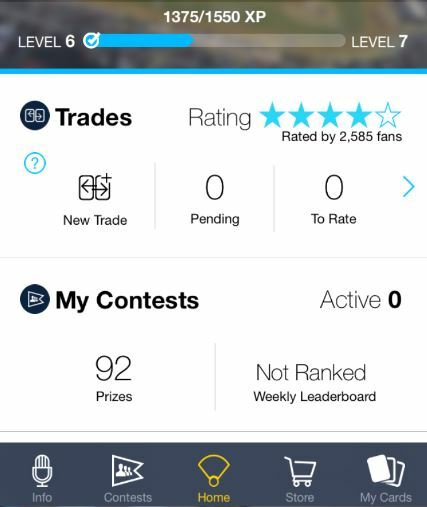 Basically, users now have a game within the game that feeds off both collecting and contests, as well as opening packs and staying engaged with the app. Not only will levels help you get further in the contests, as mentioned above, but there is potential for it to open new parts of app too. The higher your level, the more you will be recognized for being a top user, including the potential to display it in articles and other parts of the game. Collection score wont be going away, but it could be less of an indicator of importance than it used to be. XP is also gained from collecting inserts and sets, and the higher the quality of the set or insert, the bigger the XP boost will be. Pulling a sig variant will give a large boost, where a lesser insert may not give as big a total. Users get XP for checking in as well, and a weekly bonus looks to be quite a big boost. If you dont already check in with Bunt every day, you will want to. The rewards system for leveling up looks pretty lucrative as well, even with the glitch that happened last night. Leveling up will give cards and coins, I would guess, but right now it isnt working while they fix the issues that happened for some lucky users. As of now, there will be 300 players involved with the base set, and more will be released as the year goes on. Each base will have 10 levels, with 5 in packs, and 5 available through direct purchase or card exchange (similar to the Den in SWCT). Each card will go up in boost, and the five pack pulled variants are pretty much the same boost levels from 2015. The higher levels are more in line with the post season last year, topping out at 5x. They want to make the 5 additional levels of base very special so that they arent easy to get, but also not impossible. Obviously, the nature of Bunt is quality and quantity in your base for scoring purposes, which means people wont want to shred a whole collection to get a higher level. He did stress that levels 8, 9 and 10 will take some work, but that with a lot of trading, even the F2P users can get there. Seeing what it will take to get the higher level cards, he was telling the truth. Although they are going to be tough to get right now, with some work, they will be within reach. The main levels of base for 2016 are white, green, red, blue, and orange. The higher levels are teal (2.2x), purple (2.5x), black (3x), silver (4x), and gold (5x). You can see that with 1x jumps on the final 3 levels, its going to be cool to get those. Another cool new feature that Mike talked about at length was the Card Exchange. They are bringing it over from SWCT’s Smuggler’s Den, and its one thing that I think will be really awesome. They are likely going are using this as a way fund the higher base variants first, but I could definitely see them expanding this to other usages. As we have already talked about, levels 6-10 will only be available outside of the normal base packs. Some of those levels will have random packs that are available through direct purchase, contest wins, or even VIP status. The card exchange is player specific, so if you want a Carlos Correa Purple, you will have to shred Carlos Correa cards plus equipment to get it. The equipment have levels as well, and many of them can be pulled in the available special packs. Some of the equipment is universal, other pieces of equipment are batter or pitcher specific. Helmet, Batting Glove and Bat are hitter specific, where rosin bag, hat, and ball are pitcher specific. Cleats and Gloves are universal. There are 7 levels of equipment – Blue, Orange, Teal, Purple, Black, Silver and Gold. They correspond with the card exchanges for those levels of base. Equipment could end up being pretty valuable in the higher levels, so dont trade your dupes away – especially if you will eventually be able to shred them for other colors. This was definitely my favorite new thing of the offseason. I thought it was a fun way to get premium and less premium insert cards into the game, and that’s only the start of it. With the new build, Bunt will be partnering with the physical team to deliver some of the best cards Topps has to offer on a monthly basis. In addition to the monthly boxes, Mike mentioned there may be other sets delivered in a similar type format, as mentioned with the Blasters for contests and other types of cards. Because there are so many options available, boxes are going to be offered as a way to keep things closely related to the physical side of the business. Mike mentioned that Heritage and High Tek were both modeled as closely after the physical products as possible, including inserts in the box packs for Heritage. He talked about the growing strength of the team’s relationship with the physical team, and how closely they are going to be working together on the box concept for 2016. He talked about how people experience sets like Stadium Club and Ginter, and that a 10 card set isnt the best way to represent the fun those products represent. The boxes are a TON of work, but they are a much better representation of the fun people get from opening those packs. Overall, Bunt 2016 is looking sleek, fun and fresh. I love the way the cards look, and I cant wait to see the inserts that are definitely going to be coming. Look for further updates as we get more info!